Wanderlust – wan·der·lust: /ˈwändərˌləst/- noun: wanderlust. Definition: a strong desire to travel. “A man consumed by wanderlust” – to loose one’s self for the love of adventure. A word that seems both aimless and sensual, but describes ones need to seek out life in any and all ways and locations. The Album Wanderlust by Windmill is no different, and is just as wildly unexpected. The music is ambient but full, the vocals are piercing but mesmerizing, it is an unexpected pearl of perfect emotion in the sea of talentless hipster wanna-be’s that think eclectic is a new word for power generated by lollipops. Yes, that was harsh and unfeeling, but so many modern / folk bands that say they’re “one with the harmonies of nature” no; they just recorded themselves tuning their instruments, poorly, for an hour. Seriously, I would like to get back to the real reason Im venting, anxious excitement, Windmill. This band has created an audio atmosphere that gives you a feeling of being in both the past and the future, at one time becoming a never ending present experience in music. They have a naturally hypnotic serenity, a perfect blend of acoustic and electric, just enough echo and reverb, it reminds me of 10,000 Maniacs and New Bohemians, but non “Pop-ish”( note: the bands in reference are not “Pop-ish”, but many bands that try to duplicate the sound are). Does this review sound like it’s not making sense, like it’s not following a single thought but a merge of a million ideas coming at you from a million directions, yet making you feel like you know what Im saying, well, that’s the idea, and that’s what I get from the album Wanderlust, it is not the end of the journey, but the journey itself. Wanderlust takes you from your living room or bedroom and whisks you away to a new world, one of clear waters, blue skies, bright colors, whatever you wish it to be, whatever your dreams may yield, it is a soundtrack for Inner-space travel, within your inner-mind. The songs are joyous and vibrant, the subtle lilt, a hesitance to go too far into the unknown. It really does defy description; the only way to understand is to hear it. 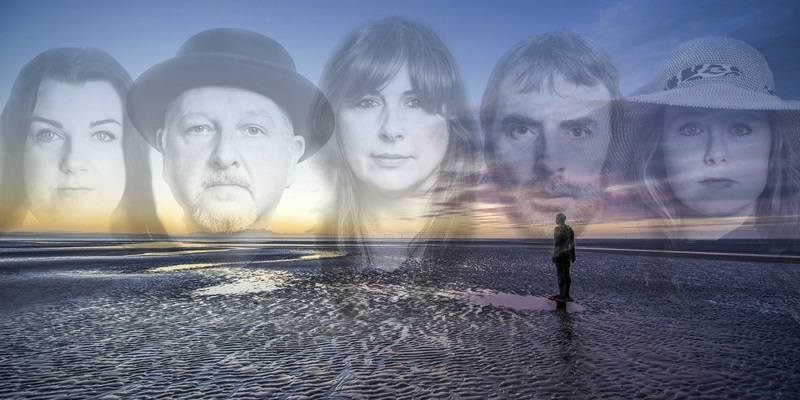 Windmill, out of Liverpool has been known for their engaging and haunting enigmatic vocals, languorous and stirring guitar riffs with atmospheric drum beats. Windmill, are Musicians Mick Dolan, Elaine Kinsella, Dawn Williams, David T Palmer, Louise Rodriguez and Jennifer Airey. Natives of Liverpool, they met just over six months ago when Mick and Dave worked on a couple of Dawns tracks and they all discovered they loved the likes of Joan Baez, Angus and Julia Stone, Neil Young, Brian Wilson, Beck, Leonard Cohen, and the Velvet Underground. They then advertised for two more female singers and Jenny and Louise joined. They were a natural union of likeminded artists and the music flowed instantly. It gained extensive radio airplay from Dave Monks, Tom Robinson, Simon Raymonde, John Kennedy, Gary Crowley, Chris Currie, Tracey Hedges and Alex Huskisson. It was one of Janice Long’s and Tom Robinson’s favorite tracks and they both said it is ‘a hauntingly beautiful song, an amazing track full of atmosphere’. The video for ‘Birdman’ can be seen on YouTube . It was shot by the legendary Phil Shotton who worked for Factory Records and filmed some of the Happy Mondays videos as well as working with the likes of New Order and The Fall, it was edited by Jez Hogg who has worked extensively for MTV.